Russian experts believe that both Russia and the U.S. have borrowed elements of spacecraft designs from each other, but nevertheless they caution that direct replication of foreign technology is extremely difficult due to structural issues in each country's industrial sector. A curious theory recently emerged in the Russian media after the failed launch of a Falcon 9 vehicle carrying a Dragon cargo spacecraft as part of a mission to the International Space Station. 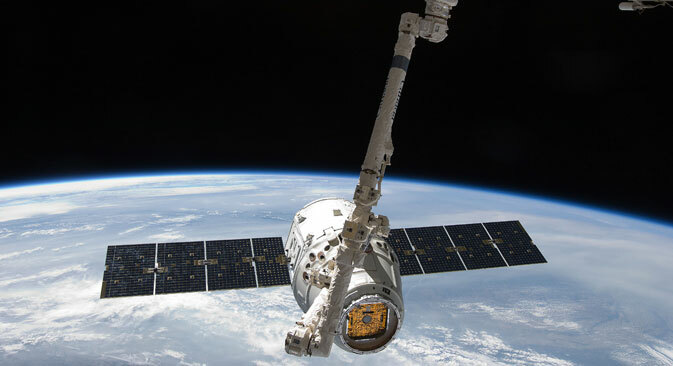 Some Russian engineers claimed Dragon, developed by the US company SpaceX, possessed several features that brought to mind Zarya, a Soviet cargo vessel designed in the late 1980’s. This is not the first time similarities between Russian and American spacecrafts have been noticed. For example, the Soviet shuttle, Buran, bears heavy resemblance to NASA's Space Shuttle. But are those really borrowed technologies, or is it just a coincidence? Is Zarya a Dragon’s babushka? Dragon and Zarya do have a lot in common. Both spacecraft are designed to be equipped with landing rocket engines, and with carrying capacity that exceeds 3,000 kilos. According to Russian scientists, some spacecraft designs were successfully replicated by foreign countries. The most famous was the V-2, the world’s first long-range ballistic missile, developed by the German aerospace engineer Wernher von Braun. Both the U.S. and the USSR copied its design in the late 1940’s. Experts say the V-2 was the original role model for the first space rockets. The V-2 missiles – both those captured in Germany after the War, and the modified versions – started the American Hermes missile program, as well as the counterpart Soviet projects, including those in the field of space exploration. The Donfeng-1, the first Chinese ballistic missile, was a licensed copy of the Soviet R-2 missile which was in turn based on the V-2. Moreover, the crew capacity of Zarya and Dragon is up to 8 and 7 members, respectively. Both also possess a conical re-entry capsule, and are reusable. Led by the brilliant Soviet engineer Konstantin Feoktistov of the NPO Energia design bureau, the development of the Zarya spacecraft began in the 1980’s, but the project was eventually shelved. Feoktistov himself believed the spacecraft's design was not refined enough to guarantee the required landing precision. Speaking of landing, Russian engineers point out that Dragon has a parachute braking system in addition to the engines – just like Soyuz, another spacecraft designed in the Soviet Union. Nevertheless, some Russian experts mention that since the spacecraft are designed for essentially identical purposes, similarities are inevitable. “Obviously, they had to be similar, since they were created with the same tasks in mind, and the only difference is the shape of the capsule - we stick to the traditional form, while the Americans prefer cones,” says Ivan Moiseev, scientific supervisor of Russia’s Space Policy Institute. As it turns out, no country has ever managed to successfully copy even a space rocket engine. A recent matter involving the U.S. buying a license to manufacture Russian RD-181 rocket engines illustrates this point. According to the agreement between the two countries, the Russians were supposed to assist their American partners with everything, from constructing the plants to installing the engines on launch vehicles. The whole endeavor, however, proved to be a waste of time and money because the entire technological chain of engine production was optimized for Russian industry and proved unsuitable for the U.S. In the end, the Americans chose to buy RD-181 engines from Russia. The Americans rejected the idea of producing the engines themselves since they would have to completely rebuild their industry. Buran: What happened to the Soviet space shuttle?